In the excellent book about Cezanne recently written by Alex Danchev, there is a quote which is well worth pondering for any artist. 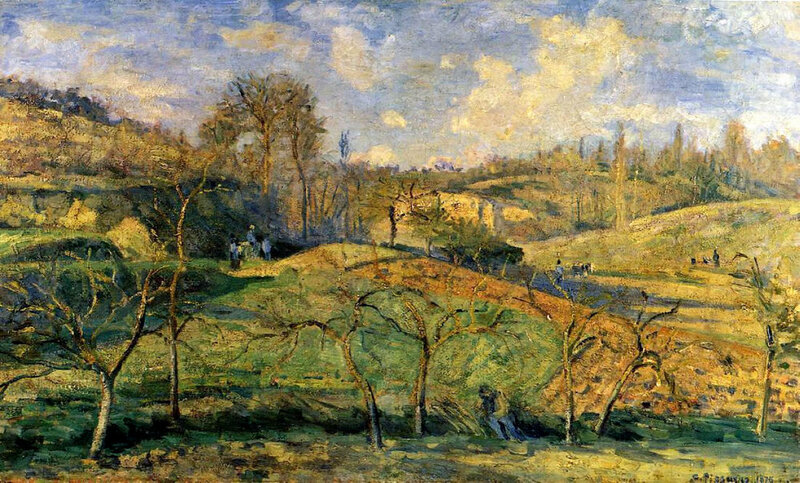 Pissarro and Cezanne painted together a great deal in 1872-74 when Cezanne lived in Auvers and was thus near where Pissarro lived in Pontoise. They sustained each other in their work and Cezanne learned from the older artist who was a natural teacher. Pissarro's teaching was noted down by the young artist, Louis Le Bail, in 1896-97 and first published by John Rewald. Danchev requotes it and I am indebted to him for its text. Look for the kind of nature that suits your temperament. The motif should be observed more for shape and colour than for drawing. There is no need to tighten the form which can be obtained without that. Precise drawing is dry and hampers the impression of the whole, it destroys all sensations. Do not define too closely the outlines of things; it is the brushstroke of the right value and colour which should produce the drawing. In a mass, the greatest difficulty is not to give the contour in detail, but to paint what is within. Paint the essential character of things, try to convey it by any means whatsoever, without bothering about technique. When painting, make a choice of subject, see what is lying at the right and at the left, then work on everything simultaneously. Don't work bit by bit, but paint everything at once by placing tones everywhere, with brushstrokes of the right colour and value, while noticing what is alongside. Use small brushstrokes and try to put down your perceptions immediately. The eye should not be fixed on one point, but should take in everything, while observing the reflections which the colours produce on their surroundings. Work at the same time upon sky, water, branches, ground, keeping everything going on on an equal basis and unceasingly rework until you have got it. Cover the canvas at the first go, then work at it until you can see nothing more to add. Observe the aerial perspective well, from the foreground to the horizon, the reflections of sky, of foliage. Don't be afraid of putting on colour, refine the work little by little. Don't proceed according to rules and principles, but paint what you observe and feel. Paint generously and unhesitatingly, for it is best not to lose the first impression. Don't be timid in front of nature; one must be bold, at the risk of being deceived and making mistakes. One must have only one master - nature; she is the one always to be consulted.